Please be aware Student Counseling & Wellness Services (SC&WS) has relocated to Modular C, Room 166. Please be aware that you must enter Mod C from the back entrance in order to access SC&WS. For more information, please call our office at (210) 784-1331. If this is an emergency please call 911 or University Police at (210) 784-1911, immediately. 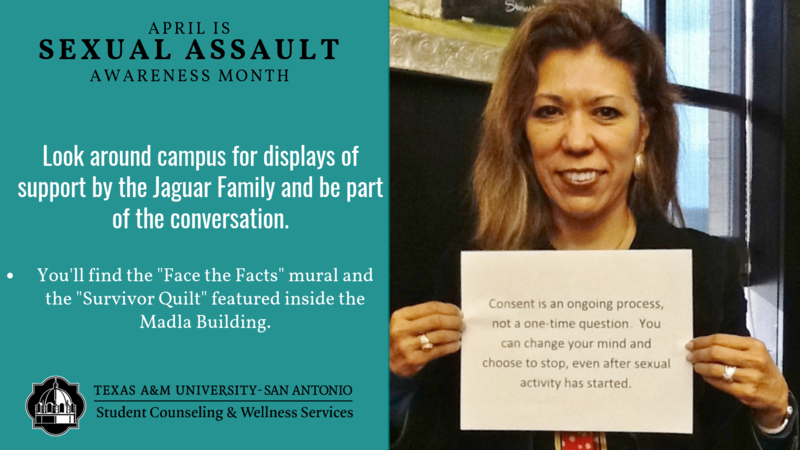 April is Sexual Assault Awareness Month (S.A.A.M. ), please join SC&WS and our campus community as we BREAK THE SILENCE by creating dialogues about violence prevention as well as providing campus and community resources. Please click here for more information and resources. 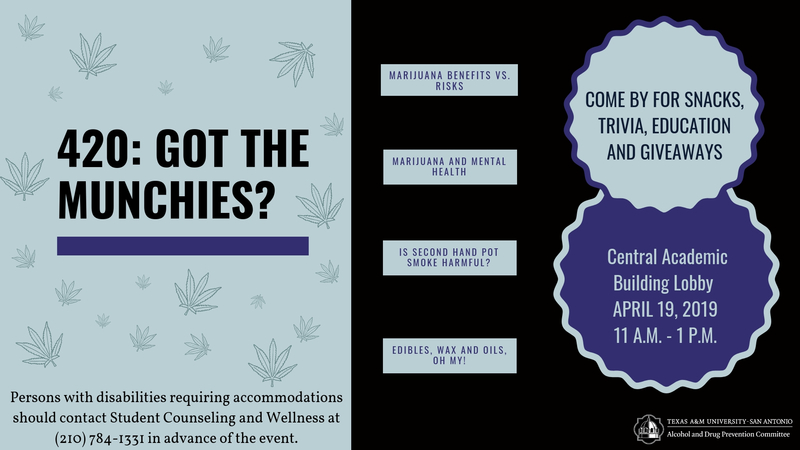 Stop by the CAB lobby from 11:00 A.M. - 1:00 P.M. on April 19,2019 for some fun trivia regarding the myths vs. facts of marijuana use. Get free brownies and have a chance to win other giveaways from Student Counseling and Wellness Services. We hope to see you there! For more information, please visit our event posting in JagSync. Interested in learning new ways to take care of yourself? Student Counseling and Wellness Services will host a drop-in group conveniently offered every Tuesday, beginning March 19- April 16, 2019. No R.S.V.P. required. 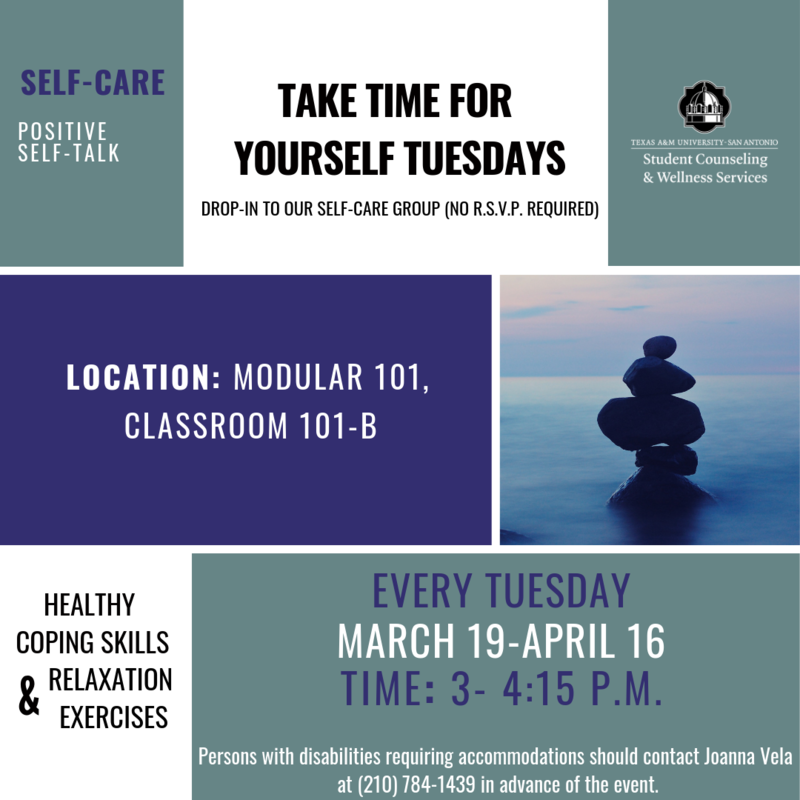 Our very own, Joanna Vela, M.A., LPC, LCDC will be present to discuss topics including: self- care, positive self-talk, healthy coping skills, and relaxation exercises. You won't want to miss this opportunity to put YOURSELF first, so drop-in! If you have any questions about this event, please call our office at (210) 784-1331. Please join Student Counseling & Wellness Services (SC&WS) for a two and a half hour workshop focused on suicide prevention and intervention for students, faculty and staff. QPR stands for Question, Persuade, and Refer - 3 simple steps that anyone can learn to help save a life from suicide. People trained in QPR will learn how to recognize the warning signs of a suicide crisis and how to question, persuade, and refer this person to the appropriate help. Each year thousands of people, like you, are saying "Yes" to saving the life of a friend, colleague, classmate, student, sibling, or neighbor. Please click here or the image below to R.S.V.P. in JagSync. For more suicide prevention information, please click here. 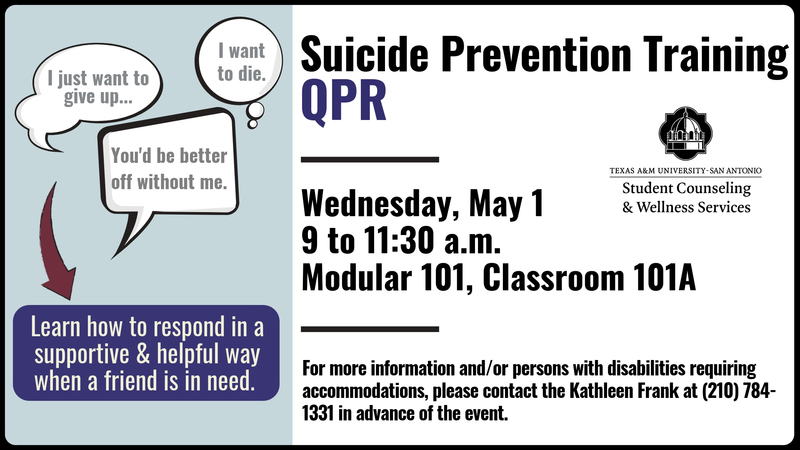 QPR: Suicide Prevention Training on May 1 in Modular 101, Classroom 101A from 9 to 11:30am. The Office of Student Counseling & Wellness Services (SC&WS) provides short-term individual, couples, and group counseling services. Additionally, we offer consultation, case management and prevention services that facilitate students’ academic and life goals and enhance their personal growth and well-being. Our staff, of licensed mental health professionals, can work with you to identify more effective strategies both to cope with difficult situations and achieve goals set with your counselor. Our mission is to provide professional mental health services and programming to the Texas A&M-San Antonio community, guided by ethics, integrity, and best standards of practice. Our vision is to be viewed as an ethical and respected mental health resource for a diverse student body.